In his first career start, redshirt sophomore quarterback Vad Lee threw for 189 yards on 7-11 passing and two touchdowns, leading the Jackets to a 70-0 victory over Elon in Tech’s season opener. Senior B-back David Sims added 47 yards on the ground with one rushing touchdown and one receiving. As good as the offense played, the defense stole the show for Tech. 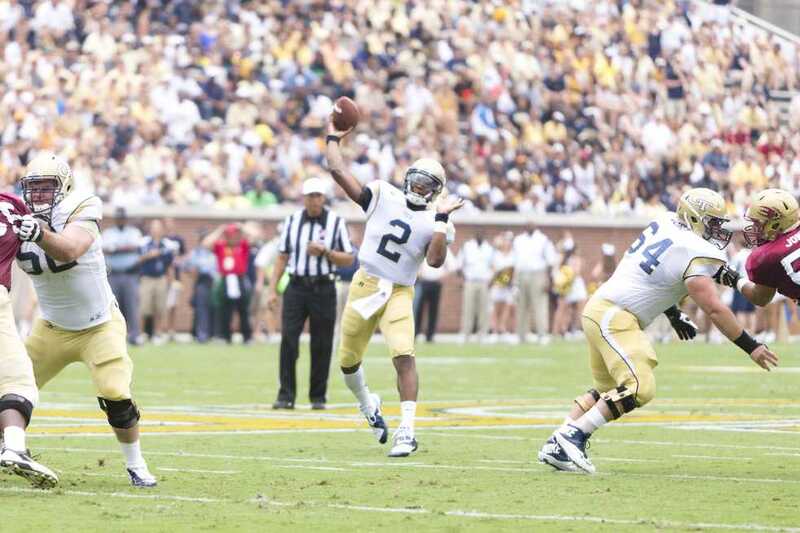 The Jackets forced four turnovers: one fumble and three interceptions. Interceptions by both Tyler Marcordes and Chris Milton were run back back for touchdowns. Tech’s 173 return yards on interceptions broke the previous school record. “Well, obviously when you win by a score that large you did some things well, and we need to build on those, but there were also some things we didn’t do too well. SO we’ve got a lot to do to get ready,” Coach Johnson said. It didn’t take long for Tech to show what they hope will be an improved defense under new coordinator Ted Roof. On Elon’s second play from scrimmage Tech forced a turnover, a fumble recovered by Tech cornerback Jemea Thomas. Junior A-back Deon Hill would punch it in four plays later on a 14 yard run to put the Jackets up 7-0. After Tech forced a three and out on Elon’s second possession, Chris Milton blocked the punt, which was recovered on Elon’s 35 yard-line. Two plays later Micheal Summers caught an 18 yard pass, setting up a one yard rushing touchdown by David Sims to cap off the drive and put the Jackets up 14-0. Elon finally started to move the ball a little, until linebacker Jabari Hunt-Days picked off Elon quarterback Mike Quinn and returned it to Tech’s 49. The drive would lead to another score for the Jackets. This time on a Zach Laskey 37 yard run up the middle to put the Jackets up 21-0 with 6:00 still remaining in the first quarter. Tech would continue to pour it on as Charles Perkins ran for a three yard touchdown to put the Jackets up 28-0, then Vad Lee would connect with Sims on 59 yard touchdown pass on the opening play of the second quarter to increase the lead to 35-0. Elon looked as if they were finally started to gain some momentum on their first possession of the second quarter, marching down all the way to Tech’s ten-yard line. The first threat of the game for the Phoenix ended quickly after Tech linebacker Tyler Marcordes picked off the pass and ran it back 95 yards for a touchdown to put the Jackets up 42-0, which would be the score going into halftime. Tech opened up the second half on a 75 yard scoring drive capped off by a two-yard touchdown run by Lee to go up 49-0. With 7:08 remaining in the third quarter, Tech safety Chris Milton picked off a Mike Quinn pass and returned it 46 yards for Tech’s second pick six of the game. After an Elon three and out, Johnson sent Lee back out to show off his arm. It took the Jackets just four plays to go 82 yards down the field, in which Robbie Godhigh caught a 24-yard touchdown pass from Lee. “We were planning on letting him play one more series, to let him throw the ball and work on that,” said Coach Johnson. Redshirt freshman quarterback Justin Thomas, who made his collegiate debut earlier in the second quarter, scored his first touchdown on a 44 yard run with 7:30 remaining in the fourth quarter.